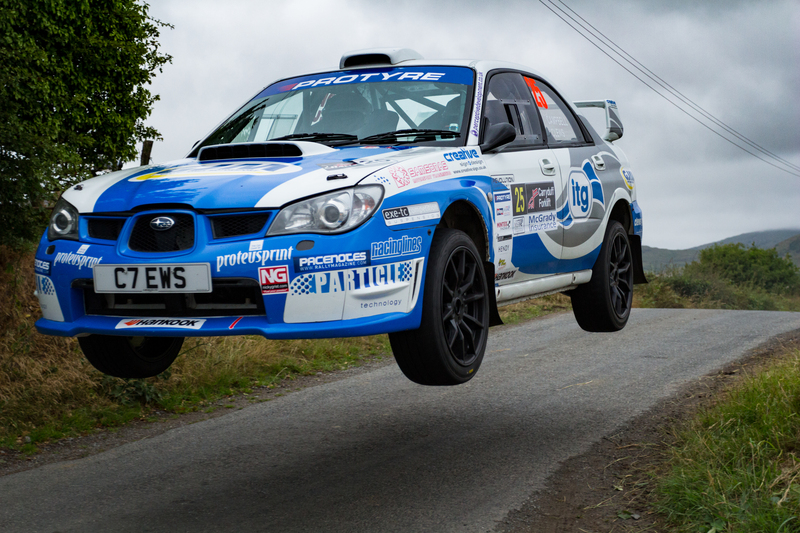 Last weekend’s Carryduff Folklift Down Rally, the fourth round of the Protyre MSA Asphalt Rally Championship, was to prove a tricky and demanding round for ITG General Manager and wheelman Richard Clews. Despite having the enviable talent of current BRC points table leader Matt Edwards alongside, taking a rare moment in the co-driver’s seat, things were not to go to plan for the capable duo. The Down Rally, a Rathfriland MC and Ballynahinch & DMC organised event takes place over 100 stage miles on closed roads in County Down in July and never fails to offer fans a superb combination of cars, drivers, scenery and action. Many of ITG’s customer and dealers are based in Ireland, so hopes were high of Clews and Edwards flying the flag during a weekend of almost textbook, dry weather. With Edwards by his side, Clews was clearly in an ebullient mood during set-up and recce. The events base was a great venue at what was previously an old prison site, knocked down after the good Friday agreement – now called the Eikon centre. A short half mile stage was also run around there to keep the spectators happy in a relatively closed environment, before the teams and drivers set off to truly do battle with the Irish countryside. The first of the ‘proper’ stages went well, with Clews driving superbly, Edwards notes being on point – and times looking good. Stage 2, however, was to fight back! One of Irish rallying’s most notorious stage, ‘Hamilton’s Folley’ is reknowned for its enormous jumps, one of which was to claim actual body parts during a particularly fast run. Running just an inch or two off the noted centre line created a huge leap for the Subaru, causing an offset landing, and snapping all the rear spoiler mountings. Not only did this render the otherwise usually pretty Subaru a little less photogenic, but it would also affect rear end stability for the rest of the run. Bodywork aside, the next issue was heat! With the engine getting warm, and pulling power out of the map, Clews noted that the car was down on speed. Pressing on, despite climbing temperatures and some apparent coolant loss, the next service area offered the chance to fill and re-bleed the system, offering a temporary restoration of performance, and a false hope for the next stage. Before too long the Subaru was back down on power, hurting stage times, and preventing Clews on making good on his promising start. Back in service, it didn’t look great for the team. Whilst the cooling fans had clearly been working during service checks, they hadn’t been operating on stage, causing the big drop in power. The result? A poorly engine, and plenty to spend before the next round!